In lower temperatures and uncomfortable weather, insulation jackets offer the comfort you want and the warmth you want. 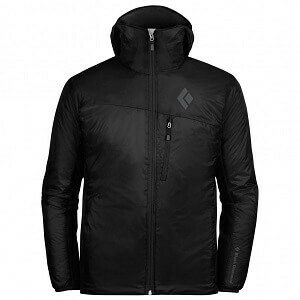 Insulating functional jackets are made from various materials, which can include synthetics, plant-based fibres, or materials of animal-origin. Insulating thermal jackets are mostly lined with mixtures of down, PrimaLoft, Polartec, Swisswool or merino wool. While some insulation jackets rely on one or the other specific material, some manufacturers like Mammut, Patagonia or Rab like to combine several functional materials in functional hybrid jackets. Insulation jackets can also be worn as insulating intermediate layer under a waterproof and windproof outer layer. Hardshell or softshell jackets are particular favourites. Not every winter jacket is fully waterproof or equipped with a breathable membrane. Some functional jackets come with a DWR treatment which causes moisture and dirt to simply run off the surface. This does not make synthetic jackets and winter coats completely waterproof but does make them much more resistant to moisture, snow and rain. When it comes to down coats and down jackets, manufacturers like to take measures to protect the actual down against moisture. Hydrophobic down has the advantage of not clumping when damp, which means it doesn't lose its insulation properties. In a warm softshell jacket or an insulation windbreaker - in addition to the material used, the cut and practical details also make a huge difference. A high collar, right up to the chin, offers the best protection from wind and cold. Whether you like a hooded winter jacket or prefer to wear an insulating jacket without a hood, is entirely up to you and your individual preferences. Hikers, who generally wear beanies in the cold, skiers and climbers, who generally wear a helmet, prefer insulation jackets without a hood. A warm and comfortable hood performs an important task, providing a further layer of weather protection. Comfortable and warm side pockets give you somewhere warm to put your hands and for sportier activities, additional ventilation openings are a great advantage. Zip closures under the arms give you perfect control over ventilation and help to avoid heat build up during strenuous climbs while skiing, hiking and mountaineering. A low weight and small pack size are an advantage in the mountains.